In recent years SHW have both drawn attention to the lack of industrial capacity in Sussex, and championed the building of more for the continued economic benefit of the county. Thankfully, things are beginning to change, and a handful of developers are being rewarded for building new industrial space which is much in-demand from local firms and global giants alike. Two local schemes in Newhaven and Hailsham deserve a particular mention as they are near completion. Block E totalling 16,038 sq ft of Eastside Business Park, Newhaven (above), is currently under construction with the steelwork being erected. Completion is due Q4 2018 with the units being capable of being let as one or being split into six units ranging from 1,980 sq ft up to 2,012 sq ft. SHW are reporting good interest from companies seeking units in the 2,000 – 3,000 sq ft size range. SHW Head of Sussex Coastal Region David Martin said: “With the shortage of available industrial and warehouse stock in the Newhaven market these units will prove attractive to both local occupiers as well as companies seeking to relocate into the area. All are attracted by the quality of the new-builds and Enterprise Zone status. Occupiers are encouraged to confirm their interest soon with the units due to be ready for occupation by the end of 2018. 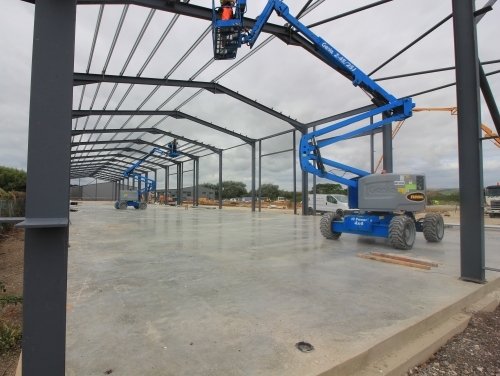 The developers Westcott Leach Ltd also have a new-build scheme under construction at Swallow Business Park, near Hailsham where the second phase is nearing completion. Terms are already agreed for a unit of 12,500 sq ft and negotiation with other parties for three units ranging in size from 1,250 sq ft.